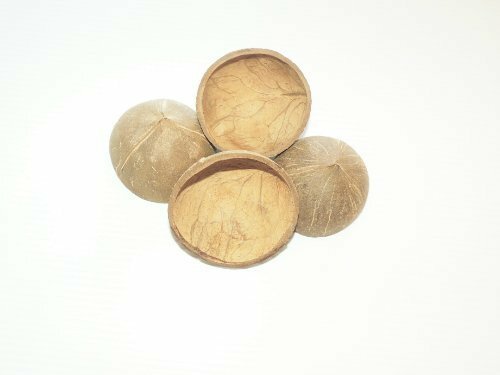 4 Small Round All Natural 1/2 Shell Coconuts: To ensure you are getting actual Jungle Beaks products & quality, you should always by directly from Jungle Beaks or an AUTHORIZED agent of Jungle Beaks... These coconut halves are cleaned and completely hairless. They are round verse oval in shape...Because these are 100% real coconut shells the sizes and both length & width do vary... Size ranges between 2"- 3 1/4" (inch) long x 2.5"-3 1/2" wide. These sizes are approximate and not exact. These are recommended for all size birds because there are just so many things you can do with them. the are are also great for other pets and craft and kid projects. You will receive a total of four, 1/2 shells... larger sizes can also be found in our store.. You can color them or you can buy colored ones from our store. If you have any questions about this product by Jungle Beaks, contact us by completing and submitting the form below. If you are looking for a specif part number, please include it with your message.